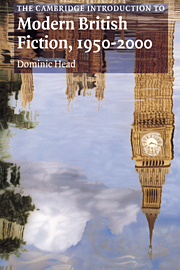 Dominic Head demonstrates how the novel yields a special insight into important areas of social and cultural history in the second half of the twentieth-century. His study is the most exhaustive survey of post-war British fiction available. Placing novels in their social and historical context, it includes chapters on the state and the novel, class and social change, gender and sexual identity, national identity, and multiculturalism. Accessible and wide-ranging, this is the most current introduction to the subject available. Acknowledgments; Introduction; 1. The state and the novel: The post-war wilderness; The testing of liberal humanism; The sixties and social revolution; The post-consensus novel; Intimations of social collapse; After Thatcher; 2. Class and social change: 'The movement'; Anger and working-class fiction; Education and class loyalty; The formal challenge of class; The waning of class consciousness; The rise of the middle class; The rise of the underclass; The realignment of the middle class; The role of the intellectual; 3. Gender and sexual identity: Out of the bird-cage; Second-wave feminism; Post-feminism; Repression in gay fiction; 4. National identity: Reinventing Englishness; The colonial legacy; The Troubles; Irishness extended; Welsh resistance; The 'Possible Dance' of Scottishness; Beyond the Isles? ; 5. Multicultural personae: Jewish-British writing; The empire within; 'Windrush' and after: dislocation confronted; The quest for a settlement; Ethnic identity and literary form; Putting down roots; Rushdie's broken mirror; Towards post-nationalism; 6. Country and suburbia: The death of the nature novel; The re-evaluation of pastoral; The post-pastoral novel; The country and the city; Trouble in suburbia; Embracing the suburban experience; 7. Beyond 2000: Realism and experimentalism; Technology and the new science; Towards the new confessional; The fallacy of the new; A broken truth: Murdoch and morality; Notes; Bibliography.